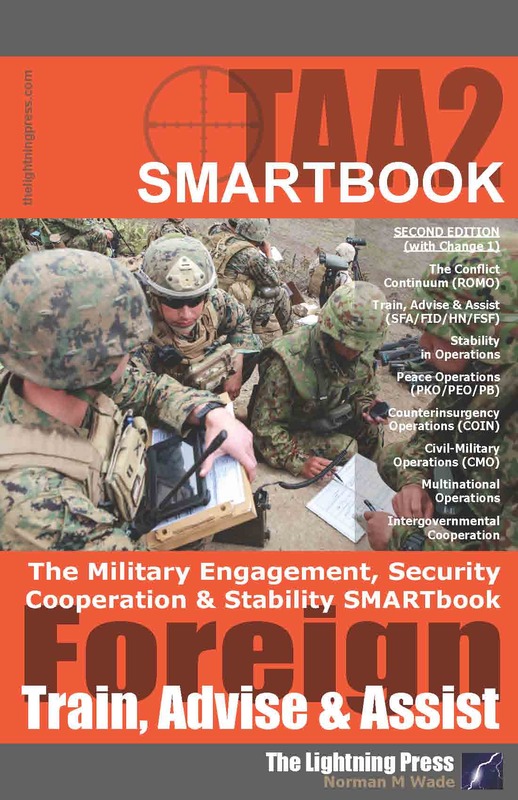 TAA2: The Military Engagement, Security Cooperation & Stability SMARTbook (with Change 1*) is the re-titled and re-focused second edition of The Stability, Peace & Counterinsurgency SMARTbook. Topics and references include the Range of Military Operations (JP 3-0); Train, Advise & Assist (SFA/FID/IDAD/HN/FSF); Stability Operations (JP & ADRP 3-07); Peace Operations (JP & FM 3-07.3); Counterinsurgency Operations (JP & FM 3-24); Civil-Military Operations (JP 3-57); Multinational Operations (JP 3-16); and Interorganizational Cooperation (JP 3-08). * Change 1 to TAA2 (Sept 2017) incorporates new material and text edits from JP 3-0 (Jan 2017), JP 3-07 (Aug 2016), JP 3-20 (May 2017), JDN 1-3 (Apr 2013), and JP 3-08 (Oct 2016). An asterisk marks changed pages. In the complex, dynamic operational environments of the 21st century, significant challenges to sustainable peace and security exist. Sources of instability that push parties toward violence include religious fanaticism, global competition for resources, climate change, residual territorial claims, ideology, ethnic tension, elitism, greed, and the desire for power. These factors create belts of state fragility and instability that threaten U.S. national security. Throughout U.S. history, U.S. forces have learned that military force alone cannot secure sustainable peace. U.S. forces can only achieve sustainable peace through a comprehensive approach in which military objectives nest in a larger cooperative effort of the departments and agencies of the U.S. Government, intergovernmental and nongovernmental organizations, multinational partners, the private sector, and the host nation. Military engagement, security cooperation, and stability missions, tasks, and actions encompass a wide range of actions where the military instrument of national power is tasked to support OGAs and cooperate with IGOs (e.g., UN, NATO) and other countries to protect and enhance national security interests, deter conflict, and set conditions for future contingency operations. Use of joint capabilities in these and related activities such as Security Force Assistance and Foreign Internal Defense helps shape the operational environment and keep the day-to-day tensions between nations or groups below the threshold of armed conflict while maintaining US global influence. Stability operations are various military missions, tasks, and activities conducted outside the US in coordination with other instruments of national power to maintain or reestablish a safe and secure environment, provide essential governmental services, emergency infrastructure reconstruction, and humanitarian relief. Peace Operations are crisis response and limited contingency operations conducted by a combination of military forces and nonmilitary organizations to contain conflict, redress the peace, and shape the environment to support reconciliation and rebuilding and to facilitate the transition to legitimate governance. A counterinsurgency campaign is a mix of offensive, defensive, and stability operations conducted along multiple lines of operations. It requires military forces to employ a mix of familiar combat tasks and skills more often associated with nonmilitary agencies and to be nation builders as well as warriors. Civil-military operations are a primary military instrument to synchronize military and nonmilitary instruments of national power, particularly in support of stability, counterinsurgency and other operations dealing with asymmetric and irregular threats. In today’s complicated and uncertain world, it is impossible to predict the exact nature of future conflict that might involve U.S. forces. This is the nature of the contemporary operational environment (COE), and training for such an environment requires a different type of Opposing Force (OPFOR) than that of the past. The Soviet threat was described in great detail in the '80s with the FM 100-2 series. The three-volume set was the definitive source of unclassified information on Soviet ground forces and the Soviet model of combined arms warfare. Used together, the series provided a thorough reference on the Soviet Army. Initiatlly, these publications were distritubution-restricted publications limited to US Government agencies. The series is now out-of-print and largely unavailable. It has been nearly thirty years since a holistic explanation of the Soviet-based Opposing Force (OPFOR) was examined in the U.S. Army Field Manual 100-2 series. 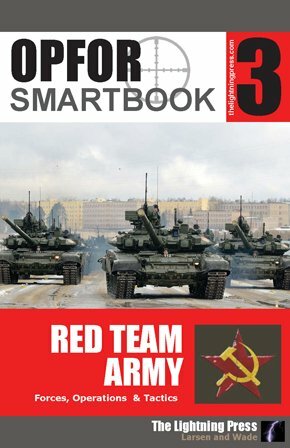 Recognizing this, OPFOR SMARTbook 3: Red Team Army re-examines and outlines the doctrinal operational construct and historical foundations of Soviet-era military forces from the FM 100-2 series. Second, OPFOR SMARTbook 3 reorganizes that foundational material and aligns it in keeping with contemporary military doctrinal taxonomy to include ADRP 3-0 Unified Land Operations and ADRP 3-90 Offense and Defense (Tactics). 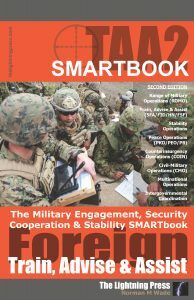 Third, OPFOR SMARTbook 3 translates and bridges the strategic- and operational-level doctrine into tactical application at the small-unit level. Through this triangulation, a more modern rendition of Red Team Armies emerges. Culture forms the basis of how people interpret, understand, and respond to events and people around them. Cultural understanding is critical because who a society considers to be legitimate will often be determined by culture and norms. Afghan values, beliefs, behaviors, customs, and norms have been shaped by Afghanistan’s rugged environment and geography; history of conflict; non-standard Islamic beliefs; tribal ethnicity; external and internal politics; and education. 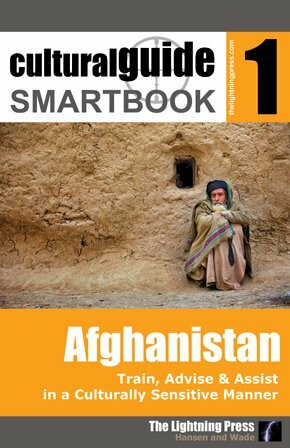 Cultural Guide SMARTbook 1 - Afghanistan contains information designed to enhance knowledge of Afghanistan, including history, politics, country data and statistics, and the military operational environment. Topics include Afghan cultural influences: ethnicity, economics, government, and the Taliban; Train, Advise and Assist topics: working with host-nation forces, developing host-nation security forces, working effectively with foreign security forces, conflict resolution and meetings, linguist support and interpreters; a chapter on life in Afghanistan (a practical view); and Afghanistan national and provincial data. Cultural awareness has become an increasingly important competency for leaders at all levels. Perceptive leaders learn how cultures affect operations. To be successful in interacting with the local population to gain information on the enemy, or to understand their requirements, military members must do more than learn a few basic facts or “do’s and do nots.” Effective leaders adapt to new situations, realizing their words and actions may be interpreted differently in different cultures. They must understand the way that their actions can change the situation for the local population (both positively and negatively) and the resulting perceptions of the population towards those actions. Military engagement, security cooperation, and deterrence encompass a wide range of actions where the military instrument of national power supports other instruments of national power to protect and enhance national security interests and deter conflict. Security Force Assistance (SFA) aims to establish conditions that support the partner’s end state, which includes legitimate, credible, competent, capable, committed, and confident security forces. There are five SFA essential tasks: organize, train, equip, rebuild and build, and advise and assist. Building relationships can lead to partnerships, and is central to security cooperation whether conducting military engagement with a foreign partner in Europe and Asia, or conducting Soldier and leader engagements with foreign security forces during operations. It is essential for the Soldier, particularly the advisor, to place a considerable amount of time and energy in establishing solid relationships among U.S. forces and foreign security forces. By its very nature, the advisor mission forces its members out of their traditional roles. An advisor must purposefully look to build solid relationships between U.S. and foreign security force commanders, staffs, and the defense establishment, as well as a variety of governmental and nongovernmental entities. Publisher's Note: The Stability, Peace, & Counterinsurgency has been superseded by a new second edition (TAA2), but is still available here for purchase as a "previous edition." Learn more about the updated, re-titled and re-focused second edition at: TAA2: The Military Engagement, Security Cooperation & Stability SMARTbook, 2nd Ed. In the complex, dynamic strategic environment of the 21st century, significant challenges to sustainable peace and security persist across the spectrum of conflict. The drivers of conflict emerge as numerous symptoms of crises worldwide. Achieving victory will assume new dimensions as we strengthen our ability to generate “soft” power to address root causes of conflict among the disenfranchised populations. At the heart of this effort is a comprehensive approach to stability operations that integrates the tools of statecraft with our military forces, international partners, humanitarian organizations, and the private sector. Stability operations leverage the coercive and constructive capabilities of the military force to establish a safe and secure environment; facilitate reconciliation among local or regional adversaries; establish political, legal, social, and economic institutions; and facilitate the transition of responsibility to a legitimate civil authority. 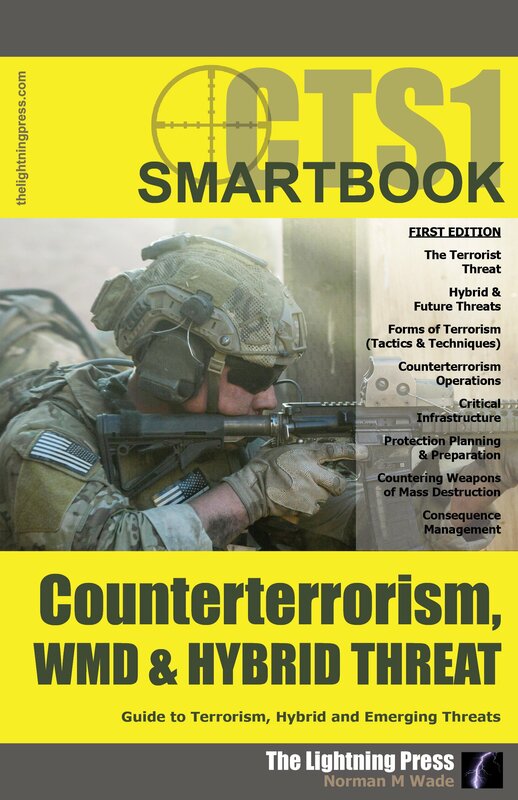 The Stability, Peace & Counterinsurgency SMARTbook is multi-service, single-source reference for stability, peace and counterinsurgency operations designed for all levels of Soldiers, Sailors, Airmen, Marines & Civilians! Includes material from FM 3-07 Stability Operations, JP & FM 3-07.3 Peace Operations, JP & FM 3-24 Counterinsurgency Operations, JP 3-57 Civil-Military Operations, JP 3-29 Foreign Humanitarian Operations, FM 3-07.1 Security Force Assistance, JP 3-16 Multinational Operations, JP 3-08 Interagency, IGO and NGO Coordination, and many more. Publisher's Note: Before purchasing The Stability, Peace & Counterinsurgency SMARTbook (Jan 2010), readers should also consider the updated, re-titled and re-focused second edition, "TAA2: The Military Engagement, Security Cooperation & Stability SMARTbook, 2nd Ed." (Aug 2016). 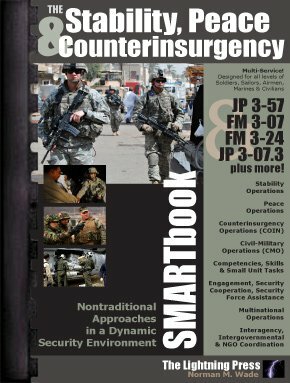 The 2010 edition of "The Stability, Peace & Counterinsurgency SMARTbook" is still available because we continue to receive special requests for it because of its unique and specific focus on counterinsurgency and stability operations at the height of OIF/OEF -- including the Dec 2006 edition of FM 3-24 (Counterinsurgency Operations) and the Sept 2008 edition of FM 3-07 (Stability Operations).